This is a handy one-pan wonder. 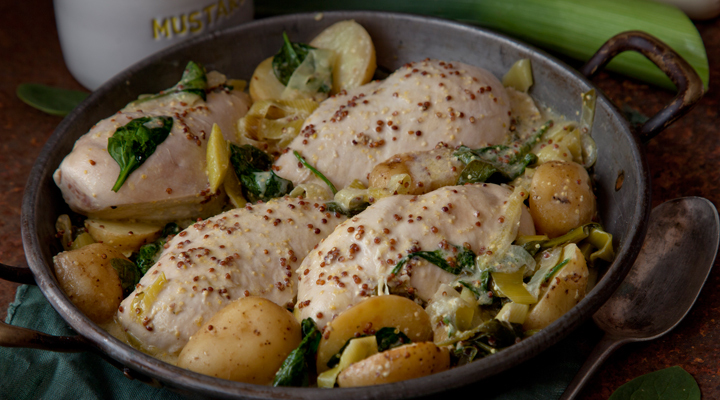 The chicken stays moist and succulent and the leeks give a wonderful flavour to the sauce. If you’re planning on freezing it, allow to cool completely before doing so and reheat gently but thoroughly before serving. Heat the oil and butter in a large sauté pan (that has a tight-fitting lid) over a gentle heat. Add the potatoes and leek and cook for 6 to 8 minutes, stirring regularly, until they are beginning to soften but not colour. Add the stock and bring to the boil, then reduce to a simmer for 3 to 4 minutes. Stir in the crème fraîche and mustard, then slide the chicken breasts in. Cover and simmer for 12 to 15 minutes, until the chicken is cooked through. Stir the spinach through for 1 minute, until wilted. Season to taste and serve straight away. Easy to make, even the hubby managed to cook this when I was working!! Lovely flavour to the chicken and stays really moist. Ideal to cook and leave until later and kids loved it. Good, simple receipe. Especially for a dinner party. I personally will add white port or wine to the sauce to intensify the flavour when reducing.